Besides the inconvenience of re-setting the clock, these outages can also mean lost programs and can translate into hours of work. Momentary power outages can cause microprocessor-operated equipment to lose its "random access memory," known by its acronym, RAM. This is the computer memory where current work or active programs are stored. On a VCR, the programming function and station settings are stored in RAM. 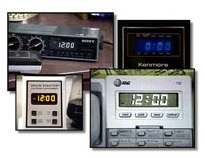 On digital clocks, the time and alarm settings are stored here. Power outages as short as one second can erase the RAM and all of the data stored there. Momentary power outages have a variety of causes originating outside the home. The most common are storms and lightning. Occasionally utility switching will cause a momentary interruption.